At this week's Samsung Forum 2011 in Singapore, we got the chance to get some hands-on time with the Samsung Galaxy Tab 10.1, the successor to the original Galaxy Tab Android tablet. 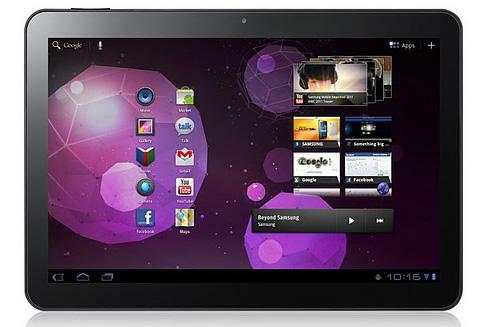 The new Tab 10.1 runs version 3.0 of Google's Android operating system, dubbed 'Honeycomb'. Unlike previous versions of Android, Honeycomb has been designed for use with tablets. The Galaxy Tab 10.1 has a fancy new 10.1in TFT screen and an 8-megapixel camera. Read our Samsung Galaxy Tab 10.1 preview. Check out our guide to the best upcoming tablets in 2011. We spent a little time with the original Galaxy Tab when it was first released in late 2010, and decided it was a quality piece of technology. It has dated quickly though — browsing is definitely slower than on newer smartphones, and the inbuilt camera is only roughly equivalent to the one in the Apple iPhone 3GS. The newer Galaxy Tab 10.1 promises to address those concerns; and in our impression is that it will deliver. The most noticeable difference between the Galaxy Tab 10.1 and the original Samsung tablet is the larger screen — it's got an extra three-and-a-bit inches of real estate and uses an excellent TFT LCD panel, which is bright, crisp and very colourful. We've consistently been impressed with the Super AMOLED screens on Samsung's smartphones like the Galaxy S, and we thought the slightly older HTC Legend had a quality AMOLED display as well. While it's not an AMOLED unit like the aforementioned smartphones, the Galaxy Tab 10.1's screen is far better than the Apple iPad's in our opinion. We also got a chance to play with the Samsung Galaxy S II at the event and while its Super AMOLED Plus screen did look smoother, we weren't disappointed with the Tab 10.1's display. The touchscreen interface never felt like an impediment while we were playing around with the Samsung Galaxy Tab 10.1 — it was smooth, well laid-out and provided easy and intuitive access to all the features we were hoping for. The interface on the Galaxy Tab 10.1 is modern and slick with a few glowing edges and dark grey pop-up boxes. It looks like it'll take well to customising and tweaking, too. The Samsung Galaxy Tab 10.1's 8-megapixel camera is a definite upgrade from the 3.2-megapixel setup of the original Galaxy Tab. We took a few snapshots of the booth we were testing the Galaxy Tab 10.1 in, in both low light and bright halogen lighting. Apart from a slightly yellowish tinge — probably a result of dodgy automatic white balance, which is easily adjusted using a touchscreen menu — the Galaxy Tab 10.1's camera delivered good picture quality. It's nice to see a high quality camera sensor on a tablet. The Galaxy Tab 10.1's camera isn't as good as a dedicated compact camera or digital SLR, but it's among the best we've seen on a tablet or smartphone. The Galaxy Tab 10.1 didn't feel especially unwieldy, but with a cover we can see it becoming excessively thick — it's definitely going to be thicker than the iPad 2 plus its Smart Cover. Whether this is a big deal, you'll have to decide for yourself. We'd say that, in comparison to the tablets currently on the market, the Samsung Galaxy Tab 10.1 is a strong contender with superior performance. When it's launched (whenever that is), it'll be up against the iPad 2 and other tablets like the Blackberry Playbook and Motorola Xoom. Campbell Simpson travelled to Singapore as a guest of Samsung.